Many people strive to preserve their ethnic identity when they undergo plastic surgery procedures, specifically rhinoplasty. Yet most plastic surgeons perform rhinoplasty surgeries with a narrow emphasis on an “American” nose type. These surgeons fail to account for the fact that noses differ based on ethnicity and have unique characteristics that patients want to maintain after surgery. Much in the same way that no two individuals are exactly alike, people of different ethnicities have unique facial characteristics that define their appearance. But primary rhinoplasty surgery often does not account for these characteristics, and as such, fails to help non-Caucasian patients get the best-possible nose job results. Thanks to ethnic rhinoplasty surgery, individuals of all ethnicities can benefit from customized nose job treatments. An ethnic rhinoplasty accounts for the distinct facial characteristics of non-Caucasian patients. Most importantly, the nose job procedure helps patients enhance their facial appearance without forcing them to sacrifice the unique facial features commonly associated with their ethnic backgrounds. 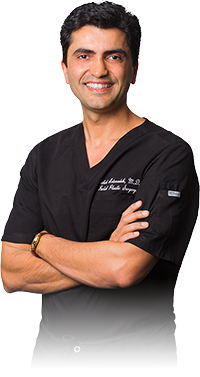 Babak Azizzadeh, MD, FACS is a facial plastic and reconstructive surgeon. He has unparalleled experience in aesthetic and reconstructive ethnic rhinoplasty surgery and, as a result, his reputation as the go-to rhinoplasty surgeon attracts patients from around the world to theCENTER for Advanced Facial Plastic Surgery. In addition, Dr. Azizzadeh was one of a select few facial plastic surgeons featured on “The Oprah Winfrey Show” for his groundbreaking advancements in facial plastic and reconstructive surgery. 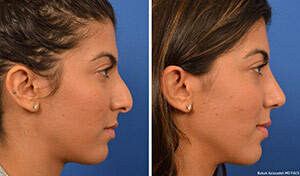 Want to see how Dr. Azizzadeh's patients have benefited from ethnic rhinoplasty surgery? Check out our photo gallery to view patients' images before and after ethnic rhinoplasty. Ethnic rhinoplasty, or ethnic nose job, is a subset of rhinoplasty. It refers to any nose surgery performed on ethnic or non-Caucasian patients. A primary rhinoplasty is performed with a simple goal: to help a patient reshape the nose or repair structural defects of the nose. Like a primary nose job, an ethnic rhinoplasty is used to ensure the nose is proportional to the rest of the face or correct structural problems associated with the nose. A facial plastic and reconstructive surgeon always considers a patient’s ethnic background prior to performing an ethnic nose surgery. The surgeon then tailors the procedure to the patient’s distinct facial features to ensure optimal treatment results. Dr. Azizzadeh believes the term “ethnic rhinoplasty” is outdated. Although there are notable differences among the nasal appearance in various ethnic groups, each person has distinct nasal proportions. Dr. Azizzadeh understands the complexities of both primary and ethnic rhinoplasty procedures. He dedicates time and resources to learn about patients and develops personalized nose surgery treatments to help patients of all ethnic backgrounds accomplish their desired nose surgery goals. With ethnic rhinoplasty, Dr. Azizzadeh tailors his approach based on each patient’s ethnic background. His goal is to help a patient achieve facial harmony while embracing a patient’s natural ethnic traits. Regardless of a patient’s ethnicity, the goal of rhinoplasty is to produce a natural looking nose that fits harmoniously with the face, eyes, cheeks and chin. Dr. Azizzadeh helps patients of all ethnicities achieve this goal, ensuring a natural outcome is delivered that brings balance to the face. What Are the Benefits of Ethnic Rhinoplasty? Enhanced Ethnic Facial Traits: Ethnic rhinoplasty brings harmony to a patient’s ethnic facial traits and helps a patient celebrate his or her family culture and history like never before. Rejuvenated Facial Appearance: With ethnic rhinoplasty surgery, patients can simultaneously reshape the nose and bolster the facial appearance. Improved Facial Symmetry: Ethnic rhinoplasty improves facial symmetry and enables patients to enjoy a nose that complements the eyes, chin, cheeks, and other facial features. Correction of Structural Defects: An ethnic rhinoplasty frequently is used to address breathing problems, a deviated septum, and other structural defects of the nose. During an initial consultation, Dr. Azizzadeh provides patients with full details about ethnic rhinoplasty surgery. He takes a holistic approach to ethnic rhinoplasty surgery and helps patients understand what to expect during the procedure. No two patients are exactly the same, and Dr. Azizzadeh will listen to each patient’s requests to learn about his or her ethnic rhinoplasty goals. He boasts a complete understanding of the underlying structures in the head, along with the nasal anatomy of many different cultures. Thus, Dr. Azizzadeh understands what it takes to help a patient maintain the integrity of the nasal function and provide the best possible aesthetic outcome after an ethnic rhinoplasty procedure. Dr. Azizzadeh has received global recognition for his ethnic rhinoplasty work. In addition to creating beautiful noses, he is also able to perform reconstructive rhinoplasty to restore the nasal function and breathing. At the CENTER for Advanced Facial Plastic Surgery, we strive to make every consultation a unique and educational experience. During an ethnic rhinoplasty consultation, Dr. Azizzadeh will find out about a patient’s rhinoplasty concerns and questions. He will learn about the areas of the nose that a patient would like to improve, how long a patient has been concerned about his or her nose and the patient’s rhinoplasty goals. Then, Dr. Azizzadeh will evaluate the patient’s nose to determine if he or she is a good candidate for rhinoplasty. Furthermore, Dr. Azizzadeh will examine the entire face as part of the consultation process. By doing so, Dr. Azizzadeh can evaluate a patient’s chin, lips and other facial features and understand how they will be affected by a rhinoplasty procedure. Dr. Azizzadeh recognizes the importance of facial harmony and balance and will do whatever he can to ensure a patient is comfortable with ethnic rhinoplasty. He is happy to respond to patient queries after a consultation as well. For patients who live outside of California or outside of the United States, Dr. Azizzadeh offers Skype consultations so that you can meet him from the comfort of your own home and not have to travel twice to Beverly Hills. If you are interested in learning more about a Skype consultation with Dr. Azizzadeh, please call our office at 310-657-2203. How Does Dr. Azizzadeh Approach Ethnic Rhinoplasty? Dr. Azizzadeh believes in a customized approach to ethnic rhinoplasty. He is committed to providing patients with a structure-based rhinoplasty that is congruent with an individual’s nasal framework and will work to maintain and improve the underlying structures of the nose to deliver beautiful end results. Moreover, Dr. Azizzadeh will understand a patient’s personal needs and approach each ethnic rhinoplasty surgery accordingly. He may use an open or closed surgical approach based on the complexity of the procedure and the area that needs to be addressed during the surgery. What Should a Patient Expect After an Ethnic Rhinoplasty Procedure? Dr. Azizzadeh recommends that a patient be evaluated several times in the first 10 days after an ethnic rhinoplasty surgery. The patient will be assessed every three months for one year and annually after the procedure, and a follow-up can be performed via Skype if a patient resides outside of Southern California. It is important to note that ethnic rhinoplasty requires a long-term commitment, and Dr. Azizzadeh will continue to work with a patient to ensure he or she enjoys long-term results. Why Should You Choose Dr. Azizzadeh for Ethnic Rhinoplasty? Ethnic rhinoplasty represents a life-changing procedure and may help a patient improve his or her facial appearance, self-confidence and more. As such, it is paramount to employ a highly qualified facial plastic surgeon to perform this procedure to guarantee the best results. Dr. Azizzadeh is a leading facial plastic surgeon who devotes the necessary time and resources to aid patients. He has earned his reputation as a globally recognized plastic surgeon and continues to support patients in any way he can. Dr. Azizzadeh has produced numerous textbooks that have become a standard in the medical community and are used by many board-certified plastic surgeons as well as training programs for up-and-coming plastic surgeons. He is the co-director of the annual Cedars-Sinai Advances in Multispecialty Aesthetic and Reconstructive Surgery Symposium and co-director of the USC Facial Plastic Surgery Fellowship Program. What make an ethnic rhinoplasty different? During a traditional rhinoplasty, a facial plastic and reconstructive surgeon often fails to account for a non-Caucasian patient’s distinct facial features. Instead, the surgeon may focus on reshaping or resizing a patient’s nose without determining how to help this individual keep his or her unique facial features intact following treatment. Comparatively, during an ethnic nose job, Dr. Azizzadeh strives to help a non-Caucasian patient achieve a nose that complements his or her unique ethnic facial features. To accomplish this goal, Dr. Azizzadeh studies a patient’s facial features closely. He then crafts a custom ethnic nose surgery treatment plan to help a patient achieve a nose that matches his or her facial features, leading to an improved facial appearance. What is the goal of an ethnic rhinoplasty? The goal of an ethnic rhinoplasty is to help a non-Caucasian patient simultaneously achieve facial harmony without putting his or her distinct ethnic facial features in danger. Following a successful rhinoplasty, a patient can enjoy a nose that corresponds to his or her eyes, cheeks and other facial features. Plus, a rhinoplasty patient can reap the benefits of a balanced, natural-looking facial appearance. Of course, ethnic rhinoplasty patients likely have their own treatment goals as well. Dr. Azizzadeh learns about an ethnic nose surgery patient’s treatment goals and works diligently to help this individual accomplish his or her goals. Will my ethnic rhinoplasty look natural? Dr. Azizzadeh wants to help a non-Caucasian patient achieve a nose that looks natural. As such, he devotes extensive time and resources to craft a comprehensive ethnic rhinoplasty treatment plan for each patient. Dr. Azizzadeh takes a holistic approach to ethnic nose surgery. Prior to an ethnic rhinoplasty procedure, Dr. Azizzadeh meets with a patient and performs a full evaluation. He also uses the Vector System to produce high-resolution, multi-angled 3D photos of a patient’s nose and face. Then, Dr. Azizzadeh can determine the best way to create a nose that fits a patient’s face perfectly. Can any facial plastic surgeon perform an ethnic rhinoplasty procedure? Ethnic rhinoplasty is a specialized procedure, and as such, must be performed by an expert facial plastic and reconstructive surgeon. Dr. Azizzadeh allocates a lot of time to study an ethnic rhinoplasty patient’s facial features and learn about his or her treatment goals. He then develops a personalized treatment plan to ensure this individual can improve his or her facial appearance. At the same time, Dr. Azizzadeh ensures an ethnic rhinoplasty patient won’t have to sacrifice his or her unique ethnic facial features. Do I need to receive a consultation before an ethnic rhinoplasty? An ethnic rhinoplasty consultation is required before treatment. The consultation often proves to be beneficial for both Dr. Azizzadeh and a rhinoplasty candidate. It allows Dr. Azizzadeh to learn about an individual and find out why he or she is considering a rhinoplasty procedure. Meanwhile, an individual can learn about rhinoplasty, find out how the procedure is performed and address any treatment concerns or questions. Dr. Azizzadeh may also use the Vectra imaging tool to show an individual how he or she may look following an ethnic rhinoplasty procedure. Ethnic rhinoplasty consultations allow Dr. Azizzadeh to craft a personalized treatment plan for a patient, too. If a patient qualifies for a rhinoplasty, Dr. Azizzadeh will develop a custom treatment plan to help him or her achieve the optimal results. Or, a patient may benefit from rhinoplasty and other facial plastic surgery procedures. And in this instance, Dr. Azizzadeh may recommend multiple surgeries to help a patient enhance his or her facial appearance. How does Dr. Azizzadeh evaluate an ethnic rhinoplasty patient? Dr. Azizzadeh strives to provide an rhinoplasty patient with a nose that complements his or her facial features and ethnic background. Therefore, he examines a patient’s bone structure, chin and lips. What are the risks associated with ethnic rhinoplasty surgery? Dr. Azizzadeh explains the risks associated with ethnic rhinoplasty before surgery. He teaches patients about all aspects of rhinoplasty surgery, and by doing so, helps them make informed treatment decisions. How long does it take to recover from an ethnic rhinoplasty procedure? Initially, an ethnic rhinoplasty patient may need about one to two weeks to recover from surgery. He or she may have a nose cast in place and experience some bruising and swelling at this time. Dr. Azizzadeh requests regular follow-up appointments to monitor an ethnic nose surgery patient’s recovery. Patients usually need to meet with Dr. Azizzadeh several times in the first 10 days after a rhinoplasty. Then, patients will be evaluated every three months and annually. Additionally, Dr. Azizzadeh is happy to respond to a patient’s concerns and questions at any point during the recovery process. Dr. Azizzadeh wants to make the recovery cycle as seamless as possible. If a patient is worried about his or her progress after the procedure, Dr. Azizzadeh is available to provide patient support. How soon can I return to work after an ethnic rhinoplasty? An ethnic nose surgery patient usually can return to work and resume other everyday activities approximately seven days after treatment. However, Dr. Azizzadeh generally recommends a patient limit his or her physical activity for up to six weeks following an ethnic rhinoplasty. Dr. Azizzadeh wants to make a rhinoplasty a stress-free experience for patients. He teaches patients about ethnic nose surgery and helps them prepare for the recovery period. Additionally, Dr. Azizzadeh continues to meet with a patient following a rhinoplasty to ensure this individual can achieve his or her desired results. Can I travel after an ethnic rhinoplasty? Rhinoplasty patients typically should avoid travel for about five to seven days after surgery. Furthermore, Dr. Azizzadeh recommends rhinoplasty patients refrain from strenuous activity for four to six weeks after an ethnic nose job. He also requests a rhinoplasty patient receive medical clearance before he or she resumes a regular workout or exercise routine. Dr. Azizzadeh provides detailed instructions to help patients prepare for the rhinoplasty recovery period. He is happy to respond to a rhinoplasty patient’s concerns or questions throughout the recovery period, too. By doing so, Dr. Azizzadeh can help an ethnic nose surgery patient enjoy a seamless recovery. To find out more about ethnic rhinoplasty and the benefits of this procedure, please schedule a consultation with Dr. Azizzadeh at the CENTER for Advanced Facial Plastic Surgery. Rhinoplasty is an extremely common cosmetic surgery, which appeals to individuals from many different ethnicities. As a result, ethnic rhinoplasty (also known as an ethnic nose job) is becoming increasingly popular. Long gone are the days of the “Caucasian nose” being the gold standard of beauty. The best ethnic rhinoplasty surgeon will not only provide a natural result but also preserve your ethnic identity, as the goal of ethnic rhinoplasty is to celebrate your ethnicity, not hide or alter it! Today, there is a resurgence in celebrating ethnic identity, which has brought about ethnic rhinoplasty (also known as an ethnic nose job). There is no perfect nose, and your nose, like your ethnicity, is unique, as people of varying ethnicities have particular facial characteristics that define their appearance. The best ethnic rhinoplasty surgeon will stray away from the “American” nose type, popularized over the last 30 or so years. The goal of ethnic rhinoplasty is to provide a balanced, natural-looking nose with improved appearance and/or function that is the best possible representation of your particular ethnic group, whether you are African American, Asian, Middle Eastern, or Hispanic. You have made the difficult decision to pursue an ethnic nose job, also known as ethnic rhinoplasty, which is a subset of the most commonly requested type of cosmetic surgery—rhinoplasty. You have chosen to obtain ethnic plastic surgery, because you do not want a “Caucasian” nose. You want an ethnic nose job that preserves your unique ethnic characteristics, while improving your facial features and/or the structural aspects of your nose such as the tip or the bridge. You should do your research and find the best ethnic rhinoplasty surgeon available to guide you on your ethnic rhinoplasty before and after odyssey, which will be complete in 1 to 2 years. Rhinoplasty is one of the most sought after cosmetic facial procedures on the planet. Today, ethnic rhinoplasty, also known as an ethnic nose job, is enjoying a rise in popularity among members of non-Caucasian populations. Most equate ethnic nose rhinoplasty with vanity, as it can restore facial symmetry and lead to increased attractiveness. An ethnic nose job can also improve nose function by unblocking nasal passages and increasing airflow, thereby, improving breathing. After all, the “European” nose is no longer the standard for beauty. The best ethnic rhinoplasty surgeon will improve the appearance and function of your nose. In addition, your unique ethnic characteristics will be enhanced, not erased. Are you contemplating an ethnic nose job, also known as ethnic rhinoplasty? Ethnic nose rhinoplasty is gaining a great deal of popularity worldwide, and it is a subset of primary rhinoplasty. The size and shape of your nose are genetically determined, and each ethnic group has a unique set of identifying nasal characteristics. What makes you an ideal candidate for ethnic rhinoplasty? What should you expect during recovery from an ethnic nose job? The best ethnic rhinoplasty surgeon should be able to answer these questions and more.